Measuring health status over time is problematic when some subjects die, because death does not have a defined value on most health status measures. This situation is different from the usual missing data problem because the health status of the dead is, in a sense, known. We examined eight strategies for incorporating deaths into such analyses using three health status measures taken from two data sets, after which we used computer simulation to explore more fully the effect of deaths. The strategies differed in the amount of influence given to the deaths, varying from none (deaths were discarded) to complete (mortality itself was the health measure). The strategies that gave less influence to deaths tended to show more favorable changes in health over time, and therefore, tended to favor the group that had more deaths. The strategies that were more influenced by death showed more negative changes over time and favored the group with fewer deaths. The choice of strategy should depend on the goals of an intervention. 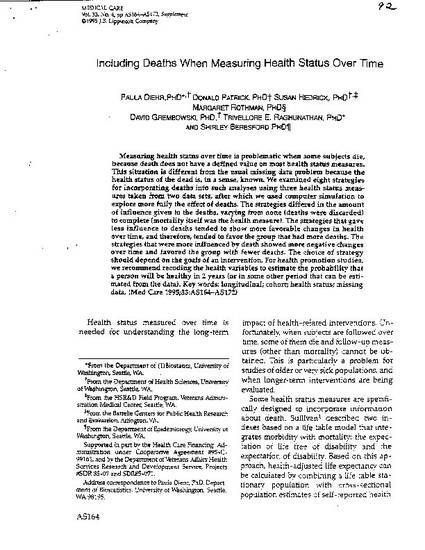 For health promotion studies, we recommend recoding the health variables to estimate the probability that a person will be healthy in 2 years (or in some other period that can be estimated from the data).